Chicago Blackhawks Invite Fans to Participate in "Beard-a-Thon"
Duncan Keith grows a pretty strong playoff beard, but can you beat him and the rest of the Blackhawks in a "Beard-a-Thon"? You'll get your chance during the postseason. Playoff beards are a wonderful tradition, and with the Chicago Blackhawks getting set to begin their first round series against the Nashville Predators this week, fans are being asked to get in on the action. As they have for the last several years, the Blackhawks will be holding a “Beard-a-Thon” for their fans as the playoffs get underway, and fans can either grow beards of their own, or they can donate money to Blackhawks Charities in honor of Ryan Hartman and Andrew Desjardins, the team’s two “Beard-a-Thon” participants. Fans who elect to grow beards will be eligible for some truly awesome prizes. 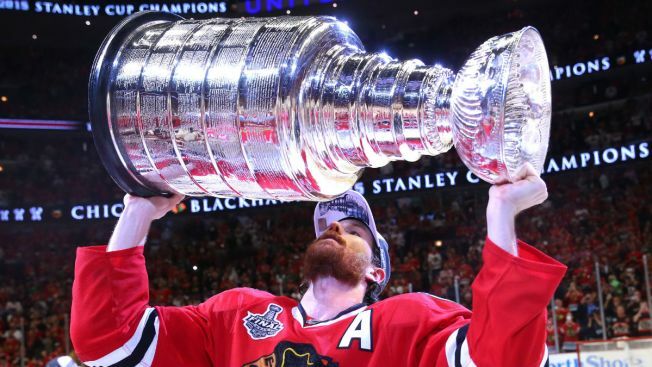 The first place overall winner in the contest will receive four 100-level tickets to a Blackhawks game next season, but more importantly they’ll get a postgame meet-and-greet with a Blackhawks player. Second prize will receive two 200-level tickets and a postgame locker room tour, and the third place winner will receive two 300-level tickets and a jersey signed by a Blackhawks player. The Blackhawks will also give away prizes in each round of the playoffs, so fans will have more opportunities to win prizes as the postseason wears on. Since the Blackhawks began hosting the “Beard-a-Thon,” they have raised over $3.5 million for charity. The Blackhawks’ playoff run will get started on Thursday night when they take on the Nashville Predators at the United Center. Puck drop is scheduled for 7 p.m. for the game, which will air on Comcast SportsNet Chicago.